A year ago, over a lunch of oysters and fine wine at a posh downtown restaurant, Baljit Chadha held himself out as the potential saviour of Quebec’s faltering asbestos industry. This week, he plans to deliver. Days before a provincial government deadline this Saturday to find private funding for the Mine Jeffrey in Asbestos, Que., the wealthy and well-connected Montreal businessman says he has “letters of intent” from unnamed investors in three different countries – enough to breathe new life into an export trade critics decry for causing death. “I have done a lot of soul-searching on this and have come to a conclusion that we are not exporting death,” said Mr. Chadha, who combines an almost evangelical fervour for asbestos with the clout needed to pull off his controversial plan. Mr. Chadha, whose company already handled much of the mine’s asbestos sales to his native India, offered to buy the mine outright in August of 2010, for “tens of millions.” But to clinch the deal, he had to secure an additional $25-million from outside investors while the Quebec government kept the mine afloat with a $58-million loan guarantee. “Yes we have the $25-million,” he told The Globe and Mail. If Quebec approves his investment plan, he hopes to ramp up annual export sales from the sprawling but largely unused mine to at least $150-million within two years. He projects $3.4-billion in sales over the next two decades. That’s a prospect that appalls health experts who note that last spring Canada stood virtually alone in blocking a proposed United Nations treaty that would have added asbestos to a list of hazardous materials restricted worldwide. Mr. Chadha came to Canada in 1973 to study science and business. Three years later, he set up Balcorp, an international trading company that today sells more than $100-million worth of Canadian goods to India annually – including between $5-million and $15-million in asbestos products. 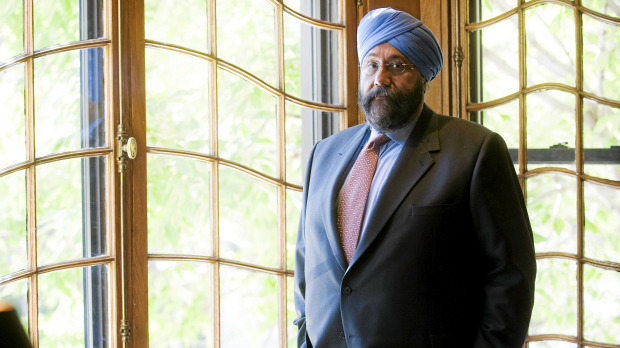 A staunch Liberal, Mr. Chadha was appointed to the Privy Council of Canada in 2003 by then-prime minister Jean Chrétien to serve on the committee that oversees the Canadian Security Intelligence Service. For more than a decade, he has accompanied prime ministers and premiers on every major trade mission to India, which last year accounted for more than half of Canada’s 135,000 tonnes of asbestos sales. And it is in his native India where Mr. Chadha faces his fiercest opposition. “When most of the world, including Canada, has either banned or restricted the use of asbestos domestically due to health reasons, it’s hypocrisy bordering on racism to expose people from poorer countries to harm knowingly,” said Madhumita Dutta of the Occupational and Environmental Network of India, one of the groups that organized noisy protests when Mr. Chadha accompanied Mr. Charest on a 2010 trip to the subcontinent to promote the province’s exports. Mr. Chadha, like other defenders of the modern asbestos industry, says the white chrysotile product of today – tightly “bonded” to reinforce cement in roofing sheets – is much safer than the loose, amphibole asbestos widely used in the past as insulation. He says asbestos provides inexpensive roofing to India’s neediest people and vows that independent health investigators will monitor his customers there. But opponents say poor safety standards and the difficulty of tracking tons of asbestos products cast serious doubt on those promises. Monday, he sat down for a tense hour-long encounter on Parliament Hill with NDP backbencher Pat Martin, one of the harshest critics of Canada’s asbestos trade. But Mr. Chadha remains undaunted and plans to meet with the Canadian Cancer Society next month to continue his campaign. • Canada is the fifth-largest producer of asbestos, ranking behind Russia, China, Brazil and Kazakhstan, but it is the only country in that group to severely restrict domestic use while encouraging exports. 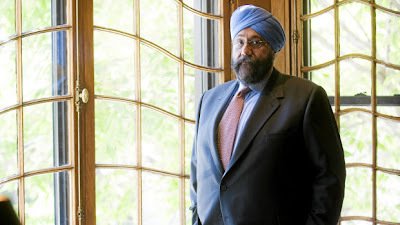 (Balcorp Ltd. president Baljit Chadha poses at his office in Montreal, Sept., 19, 2011. Mr. Chadha, a prominent asbestos merchant, is headed to Parliament Hill as part of a broader counter-offensive to salvage the reputation of his beleaguered industry.